The American Heart Association (AHA) has declared first Wednesday of every April as National Walking Day. This is celebrated every year since 2007. 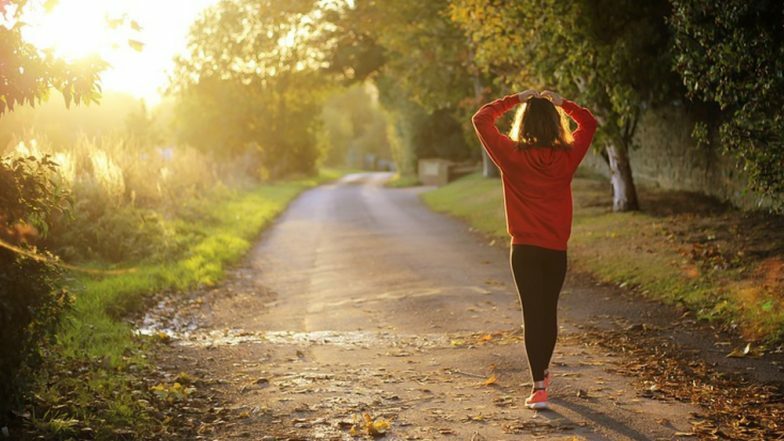 The AHA intends to remind people about the health benefits of taking a walk and encourage every individual to go for least 30 minutes of walk every day. Let us discuss why you should be walking every day for healthy living. Brisk Walking May Prevent Disability in Older Adults. Fitness does not necessarily mean going to the gym, lifting heavy weights and using cardio machines for exercise. One can merely walk every morning or at any time of the day to keep themselves fit. As per the AHA, you should walk at least 30 minutes every day to stay healthy. How is walking beneficial for your overall health? A regular brisk walk every day can help you lose weight, prevent diseases like high blood pressure and type 2 diabetes. Walking also reduces stress and strengthens your bones and muscles. One can also improve their cardiovascular system and heart fitness by taking a walk. Walking also helps to reduce the body fat and tone up the lower body. Those of you aiming for a toned up calf, should make it a point to take a walk every day. Primary muscles involved in walking are gastrocnemius and tibialis anterior/posterior, which are part of your calves. One should always walk with a straight back, looking forward. Regular walking improves your posture, which plays a vital role in your personality. Never walk by keeping your neck bent with rounded shoulders. Keep swinging your arms smoothly with a slight bend in elbows, while you walk. One should try to keep track of the number of steps, which will help an individual set their own goals. Use fitness bands or your cellphones to track the steps. It is said that 10,000 steps in a day are equivalent to 30 minutes of strenuous exercise. Always remember to do basic stretching of your leg muscles after completing your walk and start your walk with a slow pace in the first 5 minutes to warm up your body. How should your foot land while walking? While walking, one should always ensure their foot land with the heel first. Never forget to flex your foot at the ankle. As you walk, remember that your toes should leave the ground in the same order as it came in contact with. One can make their walk enjoyable by taking their loved one along with them for a walk. Always wear loose, comfortable clothes while walking and do remember to keep your body hydrated. Now that you know about the benefit of walking, you should try to take out 30 mins from your schedule every day and contribute towards the well being of your health.